Looking at that graphic after having my brain fried playing Scrabble (and drinking!) is like watching The Wall and suddenly having a “Eureka!” moment. 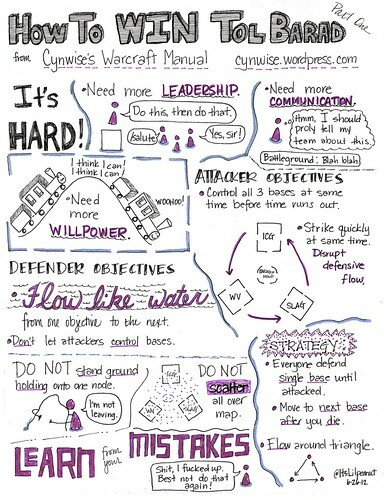 Awesome, I love sketchnotes but never thought of applying it to WoW. We need them for all BGs! Love the “Little Engine That Could” reference. I never got to tell Lilpeanut (or Cyn for that matter) how awesome that infographic is! Quickly just want to say that I greatly enjoy your work, Cynwise. Keep it up! The Alliance on Cenarion Circle, it seems, has all but given up on Tol Barad. As a Horde player, it’s nice to get the auto-reward every week, though I really do wish there could be better competition. TB is a great place to take a new 85 with crafted pvp gear and figure out where you stand and what works for your class, playstyle. It’s not as punishing as a 10 v. 10 BG because ideally, one player in sub-optimal gear shouldn’t make much of a difference. On Cenarion Circle however, I see a lot of Allies showing up wearing PVE gear, and that’s an exercise in futility. Don’t really know what the big pvp guilds are on the Alliance side, but the Horde has a couple, and those players tend to show up regularly. It’s hardly ever more than 10-15 player-per-team fight, often less than that. If you’re Horde and you fail to queue early, you won’t get in. Oh well. Cataclysm was the expansion where I “got in” to pvp, and I enjoyed the hell out of TB, for all it’s faults. Just wanted to update you on my server’s status. Thanks again!